Dove Soft Feel Compressed Antiperspirant Deodorant feels as soft as powder, and its warm floral scent of freesias and peonies reminds us of that gorgeous baby powder scent we all know and love. Part of the Dove Dry Spray range, this antiperspirant deodorant spray means you can get dressed instantly without the fear of wet patches on your clothes. As well as protecting against wetness, Dove Beauty Finish also helps to keep sweat at bay for up to 48 hours. Embrace the Cotton Soft Feel. 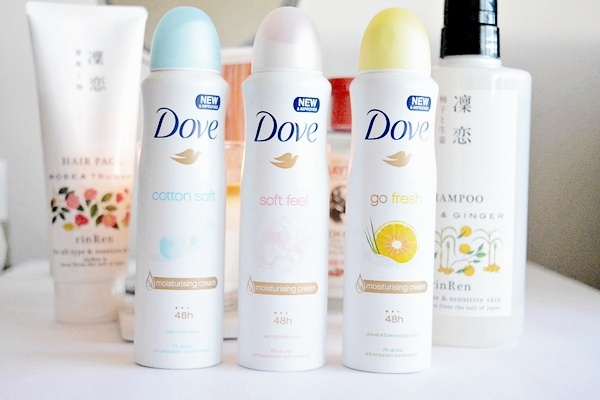 Save precious time in the morning with this Dove go fresh Dry Spray Antiperspirant Deodorant Revive. It takes seconds to apply, sprays on dry and means you can dress straight away while enjoying the refreshing, zingy scent of pomegranate and lemon verbena. In spite of its speedy application and instant drying, Dove Revive still offers 48-hour antiperspirant protection against sweat.